Eighty one years ago, an idea hatched years earlier came to fruition: take the raging rivers like the Tennessee in the Great Depression region of the Southeast, and dam them by stacking immense concrete vertical-barriers. Beavers sat back and took notes on the process of changing a river to a lake. Always a good day to kayak the Tennessee. At that time, sport came in cooling off in the hot, steamy summer days by swimming in the water or fishing for bass and catfish. Then under those big moons came romancing while “Sittin’ on the Dock of the Bay.” Yes, I know the song concerned the ocean, but docks became important to growing river sports: gotta park those toys someplace. The Tennessee Valley Authority map displays a confluence of these dams (scroll over the red dots in the link) in East Tennessee where I grew up. Around Knoxville, a half-dozen TVA lakes were easily drivable while another ten or so took a little more time to reach in the era before Interstates became prevalent. Something about small towns and stop lights slowed things down immeasurably, but they did pump your gas while cleaning the windshields . . . . Recently on a visit, I got to see some new places and new things going on the Tennessee River and its lakes behind the dams like Fort Loudon, which is the body of water flowing out of Knoxville and the University of Tennessee. 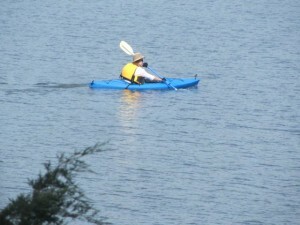 Clean waters promote kayaking like the blue kayak working its way upstream and back several days every week; great exercise, cross-training and a different look daily. 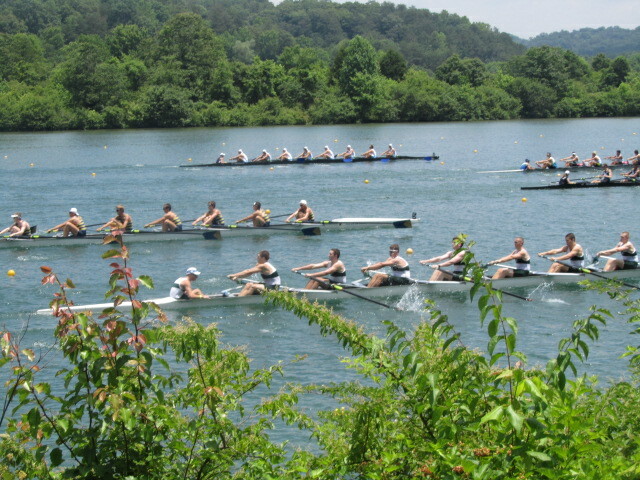 The Oak Ridge Rowing Association (ORRA) holds the US Rowing Club National Championships in July in 2014 for their third visit to the area. Oak Ridge, a city I visited as a youngster because they were developing secrets like bombs and things, is now a Mecca for rowing. They even have Atomic Rowing Teams plowing through the beautiful Melton Hill Lake waters. The expansive waters provide near-perfect venues for these races attracting teams totaling more than 1,500. USRowing’s Event Manager A. J. Dominique said, “Given the growth of club nationals over the past three years, the venue at Oak Ridge will be a good fit for the event, both on and off of the water.” ORRA president Bob Franks added “We’re going to show our Southern hospitality to everyone that comes,” which means it is so comfortable there with delicious things to eat, you will gain weight. 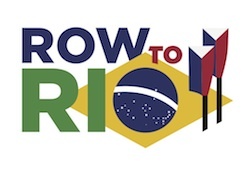 Don’t fret; you’ll lose it all in the Row to Rio campaign supporting the 2016 Olympics. Rowing burns calories like marshmallows over a bonfire. Traveling further East, one passes through Rutledge alongside the Holston River that looks from above like one of those heartbeat charts–up and down peaks. 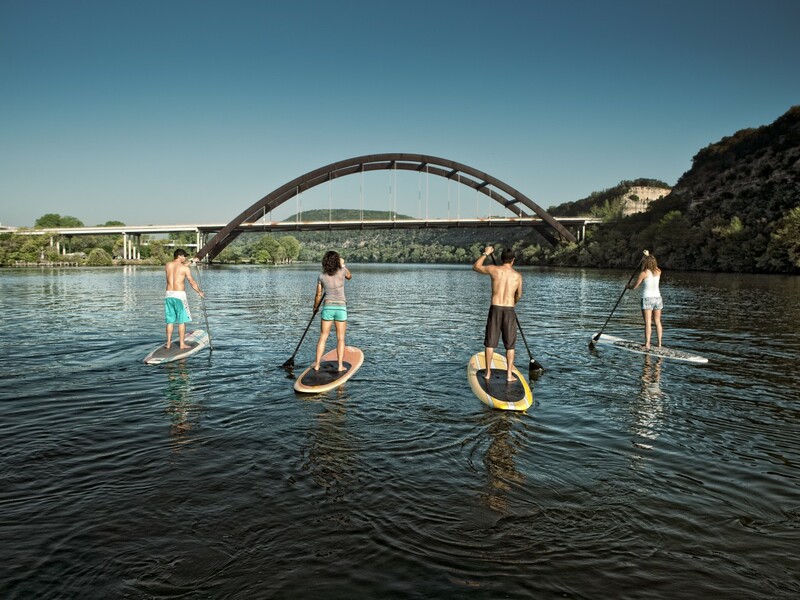 The Holston combines with the French Broad downriver as headwaters of the Tennessee River. On this route, the Ritter Farms produce the country’s best tomatoes; literally off the vine, sliced, these red bombs of nutrition offer a taste treat while chatting up farmer Ritter who is busily tallying your tab. Their honey is as close to putting a hand in the hive as I’ve found . . . without putting a hand in the hive. The land is right smack in the middle of world-famous Grainger County, home to Grainger County Tomatoes sold in quality restaurants much like Benton Hams. Their Tomato Festival (since 1929!) is huge, celebrated the last full weekend of July with a carnival of merrymaking like Tomato Wars (Hint: don’t wear a white shirt), Line Dancing, Living History reenactments with real pretty ladies, and a page full of other things to do while enjoying a ‘mater sandwich . . . or two. For the fleet-of-foot, there is the Mater Madness 5K worth the pre-registration just for the cool shirt. The event’s beauty pageant chooses eleven age-group winners wearing “formal wear, pageant dress or Sunday best.” Plus, judges are all from out-of-town; ever had a judge from Minneapolis? Count me in! 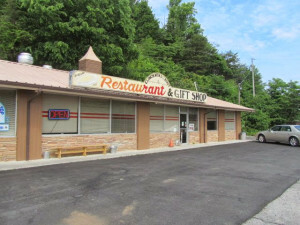 Don’t pass by the Clinch Mountain Restaurant without stopping in, having pie or vittles, and enjoying Krystal and family’s homegrown hospitality. Climbing northward, one reaches the top of Clinch Mountain a few miles away from the Battle of Bean Station. In October 1864 Union forces planned to engage Confederate fighters at a surprise 4 a.m. battle; the Confederates secretly moved out during the night. The battle occurred later that day, though, with other battalions joining to rout the grays with an ugly outcome in the terms of human life. 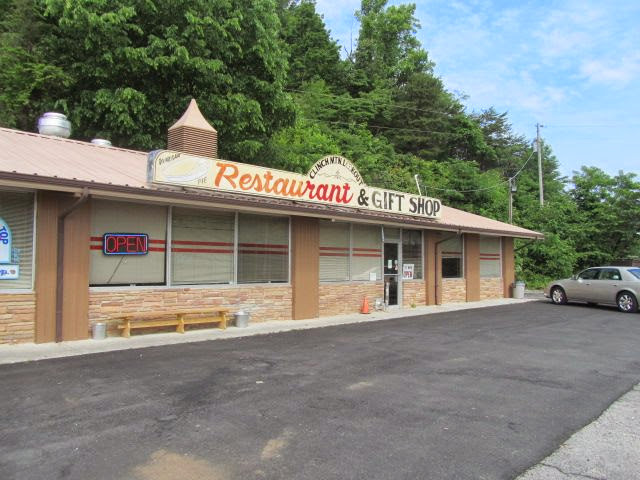 On top of Clinch Mountain, climbing nearly 4,000 feet of elevation, at the LookOut Restaurant & Gift Shop with Krystal and her young grandchildren serving food and pie, all is calm; view the valley from the comfy lodging’s picturesque setting. Looking out over the panoramic site, one absorbs the recreational paradise known as Cherokee Lake; note all the areas one can explore with a canoe or kayak. Although their Pecan Pie won my family’s “Best Favorite” vote, the most unusual taste I’ve had in a while came from her renown Vinegar Pie. As a depression-based dessert, when fruits were not available, this dessert served multiple needs. Cruising to Lincoln Memorial University, Harrogate, and the famous Abraham Lincoln Library and Museum resting on campus, is a must-do visit, too. To get there, one rides Dixie Highway over rivers such as Little Sycamore Creek, which is a combo of Skaggs Creek and Big Sycamore Creek. I only point this out because Big Sycamore is a small creek while Little Sycamore is a nice river; things happen when dams occur. The road travels along the Clinch River with a nice view of Indian Creek joining in, causing one to want to pull over and go paddling. 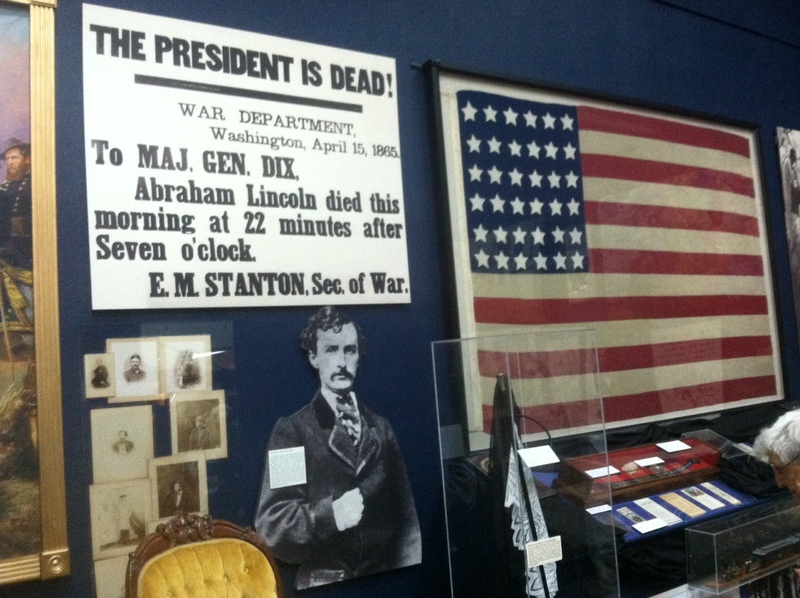 One of the dramatic displays at LMU’s Lincoln Museum, a must-visit for historians. Note their Civil War memorabilia and dramatic images. 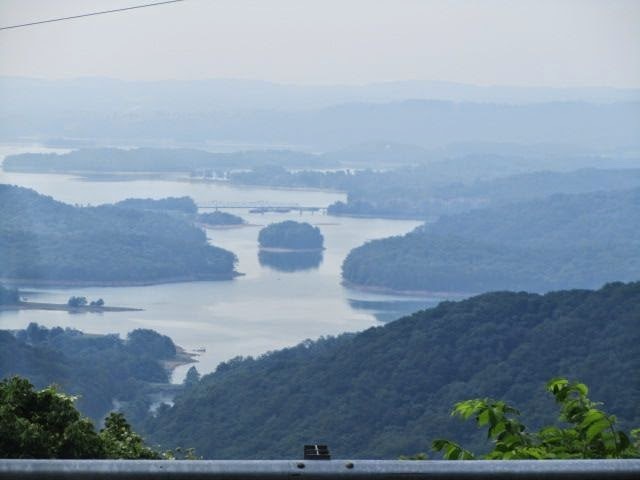 Now heading to Knoxville, passing over the azure blue waters of paradise, Norris Lake, with the new bridge spanning the river sitting half-done, stuck with problems that boggle one’s patience. As Robert Mitchum sang in the movie “Thunder Road,” we then “screamed by Maynordsville (sic),” but with the friendly police force watching the speed tallied only a tiny “eke.” That’s okay, no need to hurry; it’s too peaceful cruising through these lush valleys topped by mountain ranges. 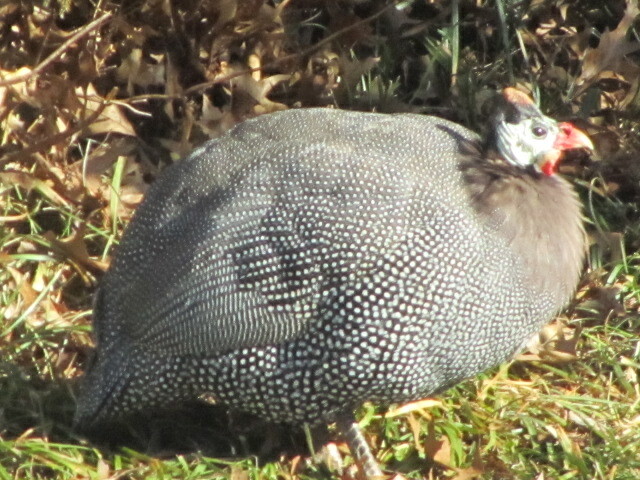 One of the Guineas poses before again pursuing spiders, ticks, flies, wasps, termites; a fowl exterminator! Now crossing the Tennessee River, Fort Loudon Lake, on Alcoa Highway’s Buck Karnes Bridge, we sat back on the porch, entertained by the river traffic and wild life. Two Guineas who call my brother’s property home, squawk their feelings on the interruption. Who can blame them? This entry was posted in Destinations, Features, Homepage Featured and tagged Battle of Bean Station, Buck Karnes Bridge, Cherokee Lake, Clinch Mountain, Clinch River, French Broad, Grainger County, Guineas, Holston River, Knoxville, Lincoln Museum, LMU, Loudon Lake, Melton Hill Lake, Norris Lake, oak ridge, Oak Ridge Rowing Association, Olympics, Ritter Farms, Rutledge, Tennessee river, Thunder Road, tomatoes, US Rowing Club by Phillip Gary Smith. Bookmark the permalink.